Remy Alexander was born into the elite meritocracy of the Okarian Sector. From an early age, she and her friends were programmed for intellectual and physical superiority through specialized dietary regimes administered by the Okarian Agricultural Consortium. But when her older sister Tai was murdered in a brutal classroom massacre, her parents began to suspect foul play. They fled the Sector, taking their surviving daughter underground to join the nascent Resistance movement. But now, three years later, Remy’s former schoolgirl crush, Valerian Orleán, is put in charge of hunting and destroying the Resistance. As Remy and her friends race to unravel the mystery behind her sister’s murder, Vale is haunted by the memory of his friendship with Remy and is determined to find out why she disappeared. As the Resistance begins to fight back against the Sector, and Vale and Remy search for the answers to their own questions, the two are set on a collision course that could bring everyone together—or tear everything apart. In this science-fiction dystopia, the mother-daughter writing team of Kristina, Amira, and Elena Makansi immerses readers in the post-apocalyptic world of the Okarian Sector where romance, friendship, adventure, and betrayal will decide the fate of a budding nation. Born and raised in Southern Illinois, Kristina has a B.A. in Government from University of Texas at Austin and a M.A.T. from the College of New Jersey and an opinion on everything. She has worked as a copywriter, marketing coordinator, web and collateral designer, editor, and publisher. In 2010, she co-founded Blank Slate Press, an award-winning small press focusing on debut authors in the greater St. Louis area, and in 2013, she co-founded Treehouse Publishing Group, an author services company assisting both traditionally and self-published authors. In addition to The Seeds Trilogy, she is hard at work revising her historical fiction, Oracles of Delphi, set in ancient Greece. Amira graduated with honors in three years from the University of Chicago where she earned a BA in History and was a team leader and officer for UChicago Mock Trial. She has served as an assistant editor and has read and evaluated Blank Slate Press submissions since the press was founded. She is an avid reader and blogger who also has a passion for food, wine, and photography. She has worked at wineries in Oregon and France and is approaching fluency in French. Along with working part-time for BSP, she works for a wine distributorship in St. Louis. In addition to The Seeds Trilogy, she reviews books and blogs about writing, food and wine at The Z-axis. Elena is a senior at Oberlin College where she is focusing on Environmental Studies especially as it relates to her passion–food justice. She’s also studied studio art and drawing and has had her work featured in several college publications. While in high school, she won numerous writing and poetry awards, was awarded a scholarship to attend the Washington University Summer Writing Institute and attended the Iowa Young Writers Studio. She also won a scholarship to represent her mideast cohort as the “resident” blogger during her study abroad in Amman, Jordan. She and Amira backpacked through Europe together and share a passion for cooking, baking–and, yes, eating. Elena maintains a Tumblr and a blog, Citizen Fiddlehead, about food and other topics. Here’s the thing about The Sowing: technically, because it takes place in an ‘advanced’ society that is not our own (though it bears some strong similarities), this novel is science fiction. At the same time, however, it’s a novel about social justice, and a warning about GMO foods – something particularly timely as we fight to change labeling and live in a world where companies like Monsanto are increasingly in control of what we eat and how it grows. Aside from that, it’s also a mystery/thriller, because we follow Remy’s journey to discover the truth behind her dead sister, who is one of the victims of a mass shooting in the book’s opening chapters. More than that, though, The Sowing is a novel about family, responsibility, growing up, and the choices we all make when we try to balance the need to be part of a community with the equally great need to be true to ourselves. For this reason, it’s incredibly fitting that the story opens on a university campus, and that much of it returns to that – and similar – settings. K. Makansi is really three authors, but the women behind the pen name write with a cohesive voice. There is never a time when you wonder who wrote which part, or how the work was divided. Maybe that’s just because this is a mother-daughter-daughter team, or maybe it’s just because they’re just that good. Either way, I found the language really accessible even when the science was at the forefront of the story. I also found all the characters very well drawn and easy to relate to. Remy, of course, is the main POV character, and she’s incredibly well drawn – hopeful, smart, loving, but also bitter and confused. But even the characters on the “other side” are somewhat sympathetic, Vale especially, and remind us that those on the “wrong” side of an issue don’t see their side as wrong. I will confess that I was a little confused by some of the unusual names the authors chose to use, and one in particular – Soren – kept pulling me out of the story because a friend of mine has a partner with that name, but I got used to them, and, over the course of reading the novel, came to appreciate that it wasn’t populated by Bills and Bobs and Marys and Alices. The Sowing is part of a trilogy, which seems appropriate: a triumvirate of women writing a trilogy about seeds and growth and change. I definitely plan to read all three novels in this series. Goes well with A hearty sandwich with avocado, sprouts, tomato and Muenster cheese on freshly-baked multi-grain bread, and a glass of water with a twist of lemon or lime. 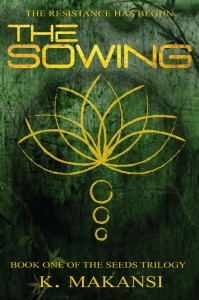 Review: The Sowing by K. Makansi by Melissa Bartell is licensed under a Creative Commons Attribution-NonCommercial-ShareAlike 4.0 International License. Thank you so much for this lovely review! I’m so happy you enjoyed the book. Thank you for sharing your thoughts!